Seems like every time you check, there's a new low-carb or no-carb diet. Recently, the ketogenic diet has been all the rage. Keto, as it has been nicknamed, is basically a high-fat, moderate-protein, low-carb diet that typically maxes out at roughly 50 grams total carbohydrates per day. Going keto may be beneficial for certain people. But proceed with caution before drastically cutting carbs. There's no one-size-fits-all when it comes to diets, so seek the advice of a dietitian (RD or RDN) to figure out what's best for you. 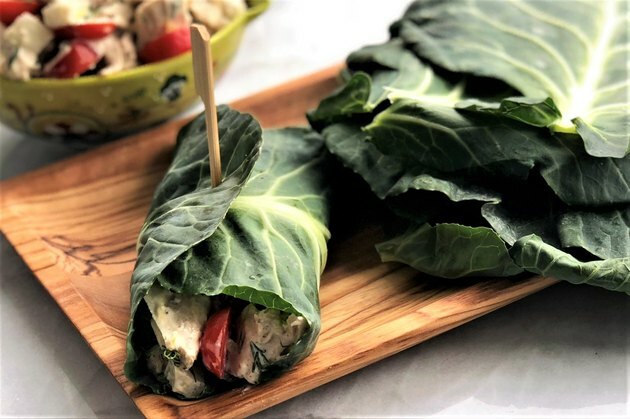 In the meantime, if you're keto-curious, you'll find these recipes are ideal to get you started: Each provides 15 grams of total carbs or less per serving. And if you just like delicious food, anyone can enjoy these dishes, even if you're on the no-diet bandwagon! Wondering what all the hype over keto is about? First, there's preliminary research that a keto-style diet may lead to improved glycemic control in the treatment of Type 2 diabetes. What's more, the diet can be effective in the treatment of epilepsy to reduce incidence of seizures in adults and children. But in any of these situations, the diet should only be followed under medical supervision. What if you're a healthy adult? Frankly, any eating plan that provides fewer calories than your body needs can result in weight loss. And, yes, following a ketogenic approach in the short term may result in weight loss. However, there's not sufficient data to support its long-term effectiveness, benefits or safety. 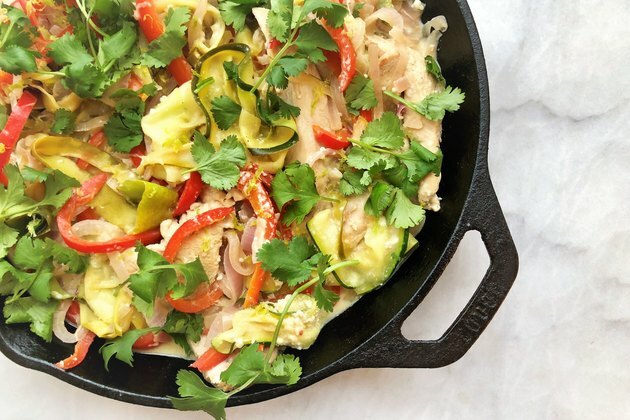 For now, do try these nutrient-packed keto-friendly recipes fit for everyone's palate! For those wanting their plates to be packed with protein, there's no better way to start the day than with eggs. And while these certainly look like scrambled eggs, they're not actually scrambled. You'll be using a gentle folding technique to make them. The result is a fluffier and more enjoyable breakfast — or, if you prefer, dinner. As a bonus, there's a dreamy addition of cheddar cheese to make them even more creamy. Ideally, choose a 100 percent grass-fed cheese because it's better for the cows, the environment and you. Grass-fed dairy is high in conjugated linoleic acid (CLA), which shows potential for helping to reduce symptoms of inflammatory conditions. 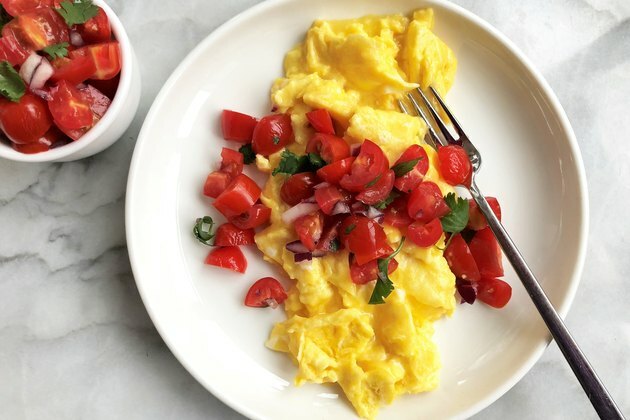 The final kicker for this delicious egg entree is a topping of pico de gallo! Keeping your main dish plain and simple (good ol' grilled chicken breast or a seared wild salmon filet) doesn't mean your side dish can't be stylish. There's definitely nothing boring about this broccoli! First, you'll want to make the dressing. 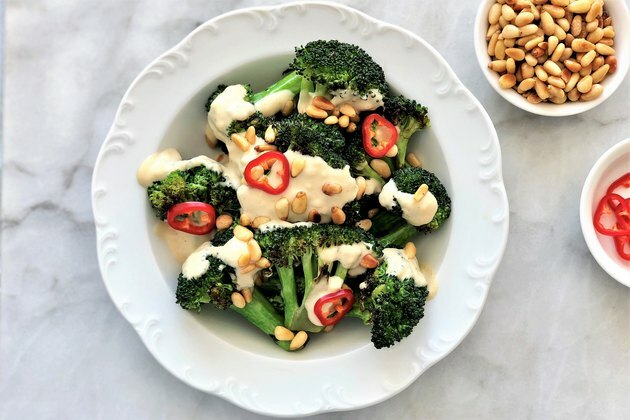 It has a tahini base, giving it a Middle Eastern twist. Then you'll want to cook up the broccoli; it starts by steaming and is finished by browning, all done on the stovetop. And consider it a scrumptious way to get isothiocyanates, namely sulforaphane, which has potential anti-cancer and anti-inflammatory properties. You can also try this recipe with cauliflower. Either way, sprinkle pine nuts on top for a nutty crunch. Another highlight of this recipe is the zucchini, which is used like fettucine noodles (aka zoodles)! It's a simple way to curb total carbs. 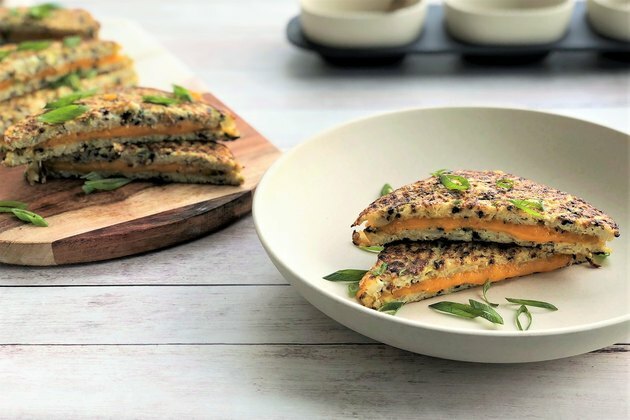 One cup of sliced zucchini provides just 19 calories and 3.5 grams of total carbohydrates while being a notable source of eye-friendly lutein and zeaxanthin. And for those who prefer, carb-friendly pasta (think Pasta Zero) can be used in place of the zucchini. The classic tuna salad sandwich was given an extreme makeover! First, you'll whisk the flavorful dressing. It's a goopy (in a good way!) mixture of grass-fed Greek yogurt, GMO-free mayonnaise, spicy mustard, lemon zest and seasoning. Then, along with the tuna you'll add plenty of nutrient-rich, nonstarchy vegetables for color and texture. Choose a sustainably caught tuna like one from Wild Planet Foods. It's one of the easiest ways to get heart-healthful omega-3s in an environmentally conscious way! The addition of almonds is the perfect final touch for nuttiness, crunchiness and a punch of vitamin E. At this point, you can totally eat this delicious concoction by the spoonful. But it's definitely more fun to eat when you wrap it up in leafy greens like collard leaves. Pick any green you like — no white bread required! 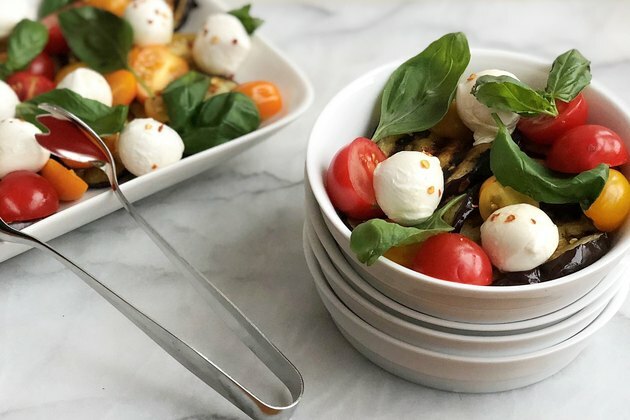 A caprese salad (or insalata caprese) is traditionally made with just tomatoes, basil, mozzarella and olive oil. 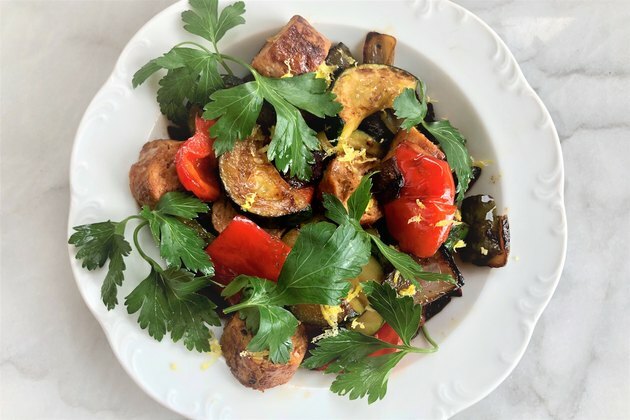 This riff on it includes grilled eggplant for added "meatiness" and smoky flair, white balsamic vinegar for flavor balance and tang and crushed red pepper flakes for a hint of heat. And for quirkiness, it's made with cute little mozzarella balls (ciliegine) and cherry tomatoes rather than large slices. Altogether, it's a nutrient-dense winner. Tomatoes offer lycopene, which may play a small role in preventing prostate cancer. Mozzarella provides bone-friendly calcium. Eggplant contains anthocyanins (these food compounds may offer promising benefits for prevention and treatment of Type 2 diabetes). And basil has additional antioxidant benefits. You can sink your teeth into a sandwich even if you're following a carb-modified diet. The trick to this one is that the bread isn't bread; it's made with cauliflower. To make it, you'll first simmer cauliflower until it's fork tender, and then you'll mash it like mashed potatoes along with three types of seeds (hemp, chia and sesame), scallions, garlic and sea salt. After it's slightly cooled, you'll stir in some eggs, which act as a binding agent. You'll then ladle this clever mixture onto a baking sheet, form into four-inch-diameter patties and bake. When the patties are golden brown, you'll top each with cheddar, bake for a few more minutes until melty, then place cheesy sides together to transform them into "grilled cheese" sandwiches. Voila! It's a cool way to boost your intake of cauliflower, a cruciferous veggie with anti-cancer potential! It's time to give more love to juicy chicken thighs — organic ones, if possible. And in this recipe, they'll certainly love you back, especially if you're a fan of curry. It's a simple-to-fix dish too. 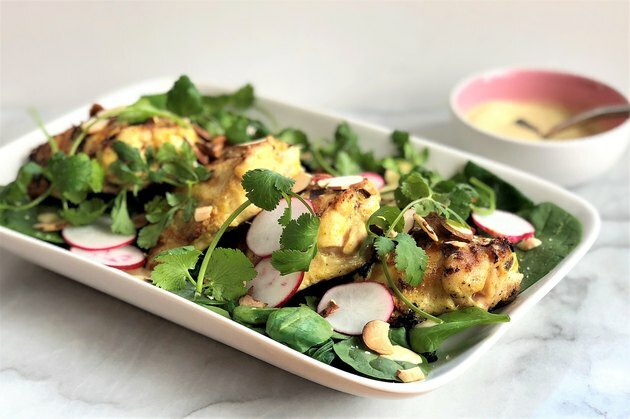 You'll toss bone-in, skin-on chicken thighs with a mixture of coconut milk, grated ginger root, curry powder and sea salt, and then grill the flavorsome thighs indoors or outdoors. You'll serve them on a bed of wilted baby spinach, which takes just a couple minutes to prepare. Finally, for added color and texture, you'll top with sliced radishes, natural almonds and fresh cilantro. Beyond the deliciousness, this entree is loaded with nutritiousness. One serving of this dish is a powerhouse of protein and an excellent source of iron. You don't need to give up rice to follow a carb-modified eating plan. 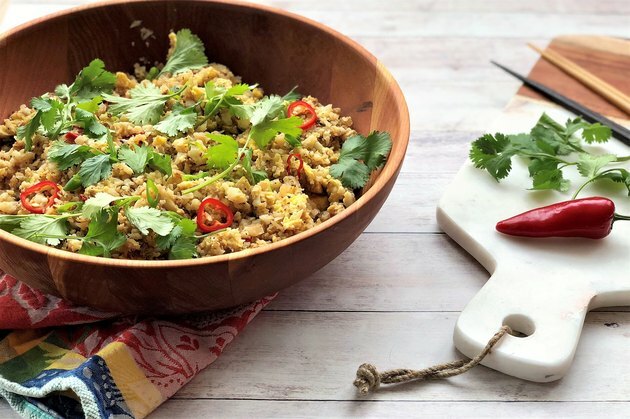 Transform cauliflower into "rice" by pulsing florets in a food processor. One of the tastiest way to enjoy this faux rice is in this Asian-style "fried rice" dish. Once you have the riced cauliflower (or purchase it already riced), the recipe is pretty easy. If you have a wok, whip it out. Otherwise, a large. deep cast-iron or other stick-resistant skillet will do. It's intentionally heavy on the eggs, so it counts as an entree if you choose to serve a big bowl of it. It's packed with potassium too, so there's no need to reach for that post-workout banana when you plan for this delightful fix. These look just like taco shells. But they're made with 100-percent Monterey Jack cheese and nothing else! And you'll fill them exactly like regular taco shells. To make these cheesy versions, create shredded cheese piles on a parchment paper-lined baking sheet. Press them down and bake until the edges are golden. Let them cool for a few minutes, and then lay each over a thick, round handle of a wooden spoon to form a shell, resting both sides of the wooden spoon on cans or jars. 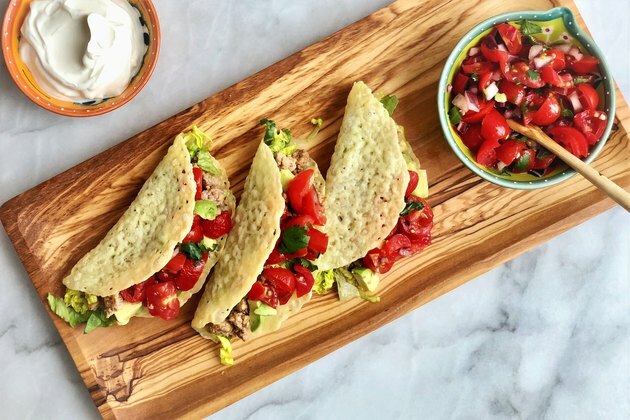 Since the shell is the highlight here, the taco filling is rather simple, including a chili, lime and turkey mixture, shredded Romaine hearts, avocado and pico de gallo. Dollop sour cream on each and enjoy. A serving (that's three tacos!) provides about half the calcium you need in an entire day! Hash brown potatoes are certainly a comfort food. But if you need to cut down on your carbs, know that hash doesn't need potatoes for it to be enticing. Just replace with zucchini. You'll enjoy knowing that 100 grams of cooked zucchini provides 15 calories and three grams carbohydrates, whereas 100 grams of cooked potatoes provides 87 calories and 20 grams carbohydrates. In this recipe, there's also red and green bell pepper and red onion. But the dish is actually best served as an entrée. That's thanks to the addition of organic or natural chicken sausage that gives this hash heartiness and spiciness. But before you serve it, finish it with freshly grated lemon zest and parsley leaves for refreshing flair and fragrance. You'll keep coming back to this recipe as a yummy way to get your veggies.